We put in the effort and our expertise and local presence, so you dont have to! We dont offer any outdated tours – we check carefully and take big measures to verify the tours to make it easy for you to pick and choose the adventure safari tour experience you really like! We are committed to offering you the best service. We continuously try to improve the jeep safari tours & routes and our services to make sure we are offering you the best jeep safari tours available at the best price. Add that we only work with trusted providers guarantees the best jeep safari tour for you! Our local experts are always ready to talk and speak with you, because we understand that you want to be relaxed. We ask all our customers for feedback on the jeep safari 4x4 adventure tours and post this under each safari listing on our website.So you can see what their opinions are regarding our safari jeep tours. We have handpicked the best local safari tours for you so you can save time and money. Skip the crowds and know that you selected the right safari adventure. We work with a handpicked group of local companies with lots of expertise and experience to bring you the best safari tours that are available on Gran Canaria. You can relax now and book with ease and full confidence here. Volcanic landviews,banana plantations,pine trees, many visits. Experience pine woods,palm oasis and reservoirs. Witness spectacular places,sandwich and drink included. Feel sensations of freedom and driving fun. Explore exciting mountains,valleys and impressive sights of Gran Canaria. A day that you wont forget fast! Drive with a buggy through adventurous roads. Visit Ayagaures Valley with breathtaking views. Explore exciting canons on bumpy roads. After you have made your reservation , you will receive an email with your ticket and a Code, that you can either print out or show the code at the pickup. ¿Can i change the date? We understand that you might want to change your date , afterall you are on holiday and everything should be easy! Call us and we try to change the date for your excursion. This was one of the best trips we've ever been to. The guide was absolutely fantastic - very knowledgeable, we spent a really fun day. 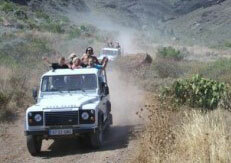 Copyright © 2013 - 2019 GranCanariaJeepSafari.com is a GranCanariaBoatTrips company.